You will not find a unit with more upgrades than this beautiful former model! This unit feels brand new with new carpet, paint, blinds, and AC. The stunning kitchen features ceramic tile floors, granite countertops, black appliances, ample cabinet space with lighting and roll-out shelves, a pantry and breakfast bar. The flowing floor plan with high ceilings includes a dining area, spacious laundry area, dual master suites with private full bathrooms and a living room with two-entrance access to the only walk up patio in the complex! 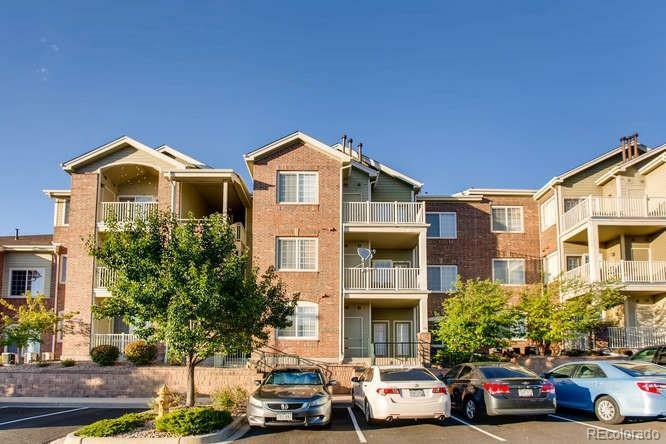 To top it all off, this complex has great amenities, plenty of parking along with your detached garage and is close to Buckley Air Force Base, shopping and E-470. Don't miss your opportunity to own this fantastic unit!